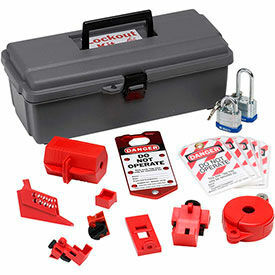 Lockout Safety Kits Are Used For Applications Including Construction, Industrial, Manufacturing, And More. 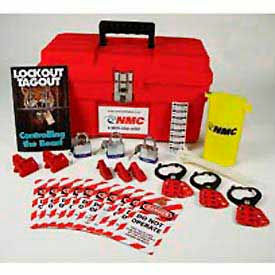 Lockout safety kits are made of high quality materials for long lasting durability and dependability. Kits provide personnel accident protection from unauthorized equipment access and operation. Units ensure lockout safety, storage organization, and inventory control. Includes various configurations of padlocks, hasps, labels, breaker lockouts, and more. Features carrying cases, board displays, or material supply centers. Padlock quantities range from 1 to 20. Hasp quantities range from 1 to 5. Label quantities range from 1 to 24. Breaker lockout quantities range from 1 to 15. Dimensions vary per model. 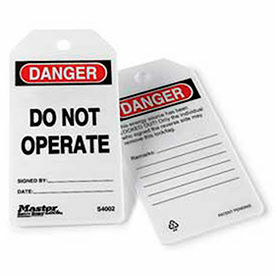 All-Weather Lockout Tags can be written on with pens, pencils or markers to communicate specific instructions. 3/8" metal grommet. Message in English only. Sold in packages of 6, priced per package. Brady Safety Lockout Kits Provide Lock Storage and Organization For Construction, Industrial, Manufacturing, and Other Applications. These Brady safety lockout kits are designed to store multiple theft preventative items including padlocks, tags, hasps, and more. The kits are made of acrylic, nylon, or polycarbonate for strength and impact resistance in heavy duty security environments. Some models include mounting boards or pouches making them easily accessible in various environments. Colors vary per model.